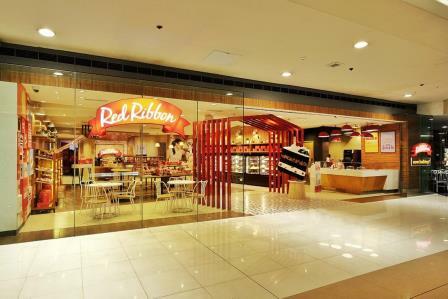 Red Ribbon, one of the leading and fastest growing bakeshop chains in the Philippines, marks another milestone as it launches its first flagship store located at the ground floor of building A of SM Megamall in Pasig City, this October 12, 2016. Red Ribbon’s new flagship store highlights design features that all combine to make both every day and special moments even more memorable. From afar, the vibrancy of the storefront makes it even more inviting. The combination of its red archways and sleek interior welcomes the customers to enter the space for a unique experience. But, what makes it more enticing is the four new design features not found in any of its branches. Upon entering the store, customers will see an Art Installation. This first unique feature showcases one of the bakeshop chain’s signature products - the Black Forest Cake. This oversized slice hits patrons with an immediate visual experience of its delicious combination of chocolate, cream, and cherry that is sure to create a craving for this all-time favorite treat. The second feature is the In-house Baking Area located at the right side of the store. Present only in this branch, customers will be treated to the sight and aroma of selected freshly-baked Red Ribbon delights that are even topped with special decorations. The third feature to the flagship store is the Huddle Area intended for customer bonding as well as for fostering community building. Activities and workshops on parenting, home baking, and personal development, among others, will be held here for our customers. The Huddle Area encourages family and friends to create and experience sweet and memorable moments even outside the home. The Ribboning Counter is the fourth unique design feature. This feature encourages customers to personalize the experience of bringing home a Red Ribbon product by allowing them to put their own touch on the Red Ribbon box. Here, they can decorate it with more colorful ribbons aside from the signature red ribbon. Aside from these new and one-of-a-kind features, the store still retains aspects that are present in most of its branches. Customers will be treated to a visual delight of the store’s many mouth-watering round cakes, square cakes, and rolls all housed in large display shelves. 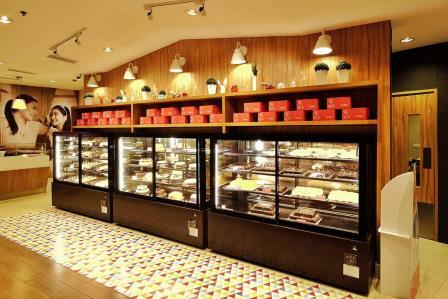 The store also has several shelves that contain Red Ribbon’s many kinds of pastries, bread, and delicacies. These are sprawled at the center and the left side so patrons can quickly get the items that they want to bring home to family and friends. There is also a colorfully designed, textured Selfie Wall that prominently shows off Red Ribbon’s iconic graphics. Here, customers can take photos of themselves as they enjoy each other’s company together with their Red Ribbon treats. 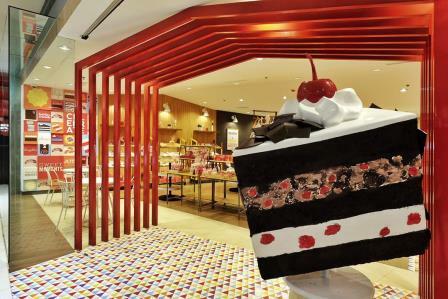 Furthermore, the store also has the special Dedication Cake counter where buyers can see how their special messages are lovingly placed on the Red Ribbon Dedication Cake. Red Ribbon will also launch the Sweet Moments at Red Ribbon App—a downloadable mobile application. This augmented reality app can be accessed at the flagship store’s four unique features as well as in other areas. With the app, visitors can take photos of themselves together with some Red Ribbon iconic elements. It also has a digital board game, which can only be acquired and played in the huddle area. “All these elements come together to complete the Red Ribbon experience of creating sweet and memorable moments for any occasion. This is our way of showing appreciation to our many loyal customers who have made our cakes, pastries, bread, and delicacies part of their family moments,” added Bandojo. Red Ribbon started as a small bakeshop in Timog Avenue in Quezon City. It further expanded into a proudly Filipino-owned business that has taken part in every Filipino family’s special moments. 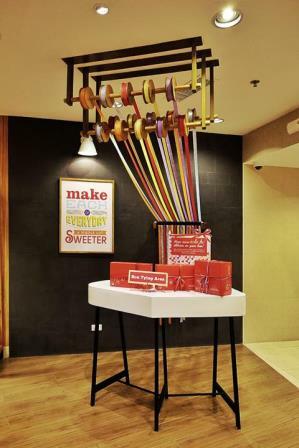 To date, the bakeshop has more than 400 branches nationwide, growing to become a hub where everyone is welcome to make sweeter moments found in every slice of its many sweet offerings.